We are a group of talented photographers and videographers who believe that your wedding is not just a gig, but a moment that needs to be captured forever. All our team has the same motto - “always be kind, friendly and above all, compassionate. 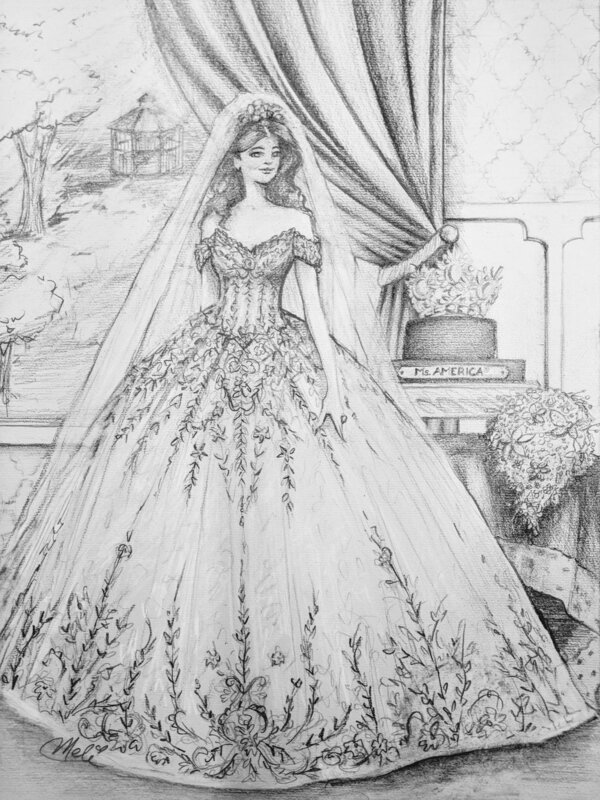 A custom made Victorian wedding gown for the occasion was created for Susan by world famous designer Stephen Yearick. This historic wedding gown had exquisite crystal beading, ornate detail and show-stopping rich embellishments. It took two years to make of which 180 days (6 months) was used for embroidery, stitching and artwork. 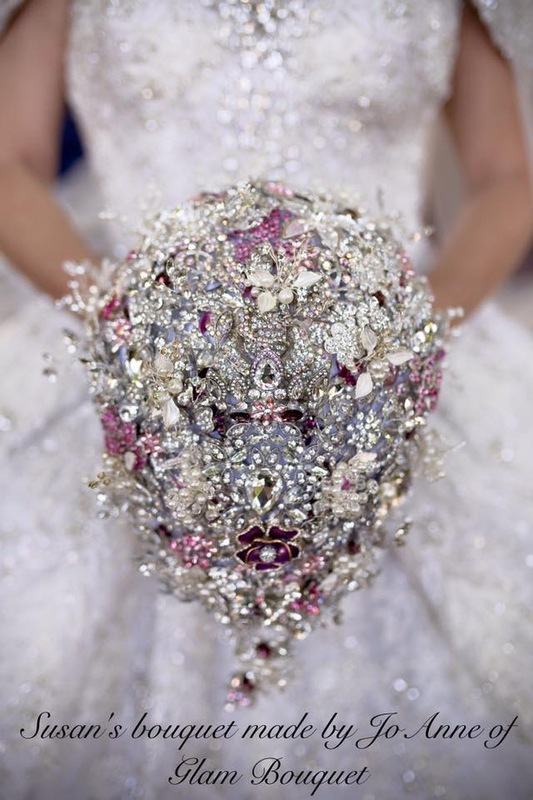 More than 10,000 hand-beaded additions were sewn into the couture gown including sequins, pearls and 10 types of multifaceted Austrian Crystals. 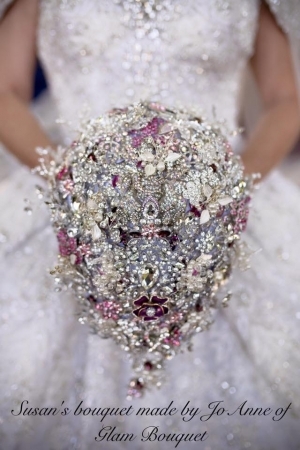 Swarovski Crystals were used in the bodice and on the sleeves of the gown. Over 100 yards of eleven types of sophisticated fabrics were used and the gown weighed 35 pounds but was strategically constructed so most of the weight was carried by the hips. Fifty people were involved in the creation of the gown which included Stephen Yearick, Leigh Price and Mon Amie’s owner Laurel Mungo. Susan Irvine Gown from ALERT THE GLOBE on Vimeo. The Irvine Historic Wedding Cake was a traditional masterpiece and a focal point of the reception. 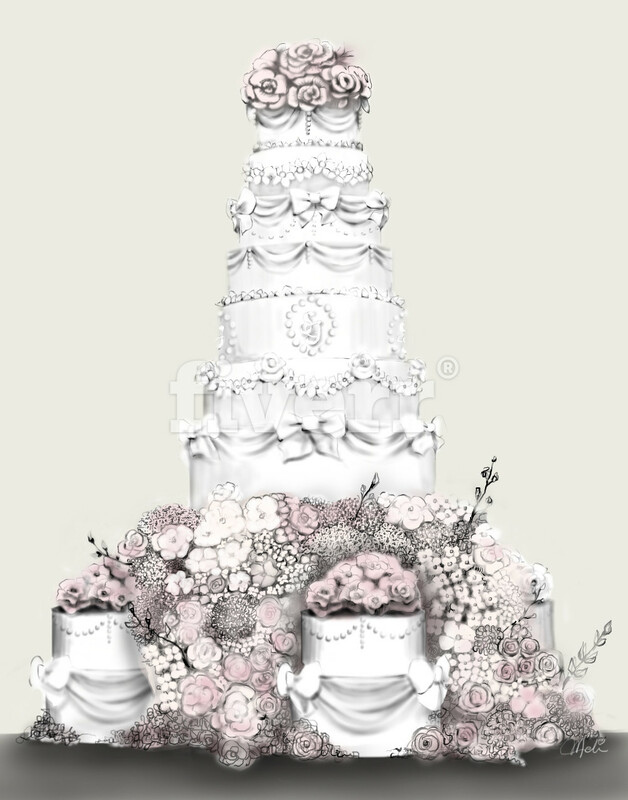 Susan and James commissioned Sunshine Guitierez from La Puente, California to design and bake the wedding cake. It took almost two years of planning after Sunshine met with James and Susan at their home for a private tasting of all the different cake flavors. Once the style of the cake was decided, an illustration was hand drawn by Melissa Nault from Montreal, Canada. The gigantic-tiered wedding cake stood 50 inches tall and weighed over 150 pounds. It was lovingly wrapped in white frosting that had 30 handmade fondant bows and sugar flowers. It took 130 pounds of flour, sugar and 180 eggs to make. The fondant was imported from Italy. Accenting the cake was Swarovski Crystals and edible 18 Karat Gold. The fifth layer of the cake had the insignia of Susan and James initials representing their union in marriage. It took three weeks to complete with handmade fondant designs and the largest cake layer took over five hours to mix and bake from scratch. Accenting the cake was a cascade of Susan’s favorite fresh flowers that included 6 different variety of roses, White Orchids, mini-roses accented with Swarovski Crystals. 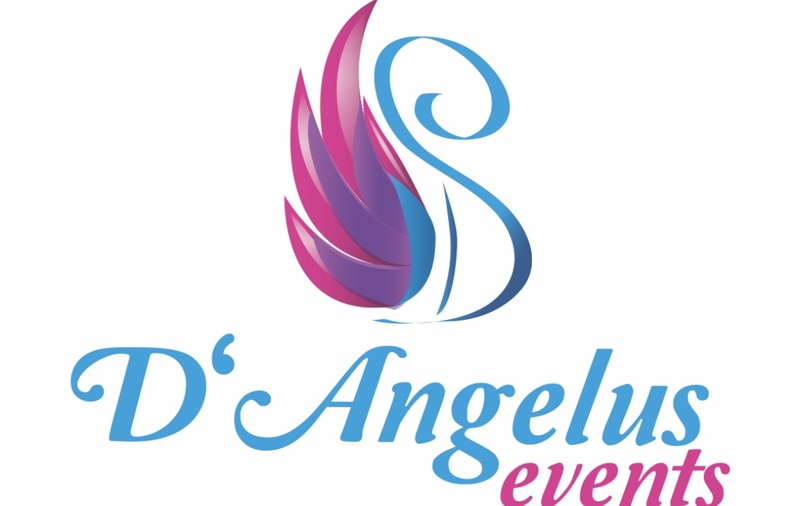 The floral designer was Carlos Sanchez from D’Angelus Events. Guests choose from three different cake flavors. Succulent Chocolate Cake filled with cream cheese and strawberry chocolate mousse; a delectable Vanilla Cake filled with cream cheese, strawberry filling and a vanilla mousse; and Vanilla Cake with white chocolate raspberry filling. Susan’s Wedding Bouquet was designed and created by JoAnne Maggio of Glam Bouquet. The bouquet was made in a stylish 12x16 inch teardrop shaped design that took over 75 hours to complete. It was filled with over 75 handpicked silver brooches, many of them being special gifts given to Susan from close friends, family and state, regional and national titleholders. Crystal charms and trinkets were added that made a statement with a special meaning expressed through the design. Some are sentimental or deeply meaningful, while others are lighthearted and playful representing things like a love of peacocks, butterfly's, roses. Along with these beautiful brooches over 500 smaller crystal and rhinestone accent pieces in silver and pink was added. The last touches was dramatic draping on the sides and center along with a beautiful silver handle. The final result was a beautiful custom Teardrop Jeweled Wedding Bouquet that Susan can keep and cherish as a forever memento and keepsake of her special day. To the distinguished wedding guests, please accept this box of elegant, hand-crafted Modjeskas in celebration of the marriage of Susan Jeske and James M. Irvine. World renowned, Madam Helena Modjeska was considered the best actress of her time and had her own celebrity endorsements in flatware, perfume and candies. In July 1876, she emigrated from Poland to Orange County, California and was good friends with James Irvine II who named his daughter Kathryn Helena Irvine after her. In 1883, she appeared at the McCauley Theater in Louisville in the play, “A Doll’s House.” A local candy maker, Anton Busath of Busath Candies attended the play and thought Madam Modjeska was so wonderful that he asked if he could name his “caramel biscuit,” Modjeska in honor of her, which she granted her permission along with her photo. Bauer’s Candies started in 1889 by Frederick Bauer, in Louisville, KY and in 1947 was granted permission from Anton Busath to carry on the name Modjeska for their Carmel Biscuit. The rich and creamy Modjeska is made the old-fashioned way with only the finest ingredients and using old fashion copper kettles on a open flame gas cooker. Each small batch is expertly prepared from scratch and hand packed. Bauer's Candies is a fourth generation family owned business for 129 years and is currently owned by Anna Bauer who is the only daughter to run the company. She considers her business to be very blessed, having been granted several opportunities nationally and internationally, which include her famous Modjeska candy being featured on The Food Network several times and featured in chains a gourmet catalogs across the country including over 600 Cracker Barrel restaurants, Williams-Sonoma stores nationwide and most recently, QVC. They even make the candy for several Lords and Ladies in Europe! A custom made Victorian wedding tent is being created for the historic Irvine Wedding reception. The innovative 50 x 100 foot tent used approximately 1500 yards of fabric and has no interior poles or supports so all the guests will have an unobstructed view of all the activities. It will have 300 feet of hand stamped 18 Karat Gold Victorian trim, with over 150 four-inch flower appliques and 300 gold tassels hand sewn around the border. It took over 5 months to make with countless hours of labor. The tent will have 56 champagne sheer cloth drapes, and 28 gold satin tassel tie backs. It took a 9 man team, working around the clock, from structural enginineers, designers and metal fabricators to seamstresses and block printers to produce the Historical Irvine Wedding Tent. 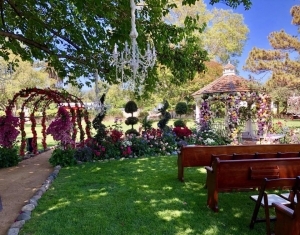 Taj Mahal Tents is proud to be the exclusive tent designer of the Irvine Wedding. The Victorian tent will turn the event into a magical experience. Taj Mahal Tents offers a wide range of elegantly designed tents that are rich in style, design and quality. It is a second generation family owned business servicing Southern California. The company is built on the strength, experience and expertise of a team that delivers the creative inspiration and operational innovation that stretches the limits of what is possible. Taj Mahal Tents sets a new standard of Service, Excellence, Reliability, Creativity, Inspiration and Innovation! 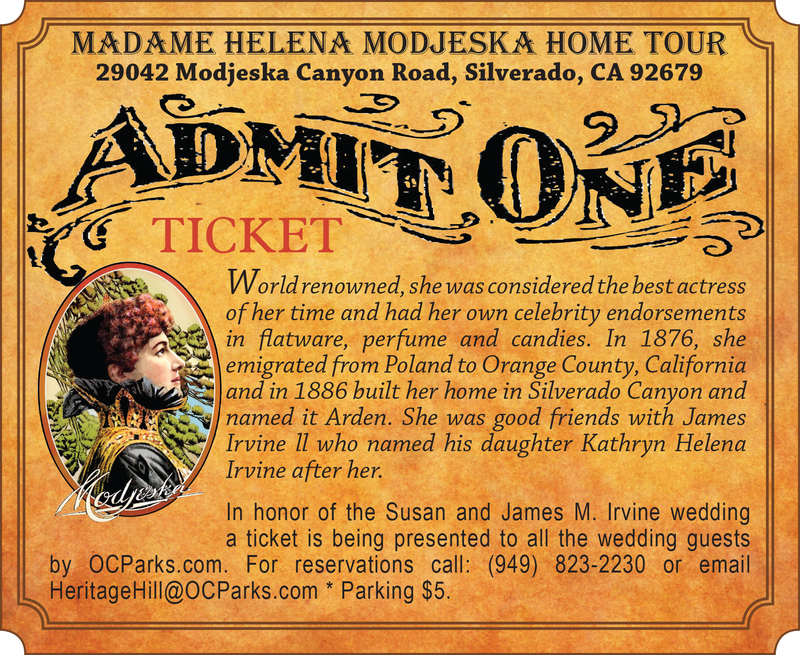 In honor of the Susan and James M. Irvine wedding a complimentary ticket is being presented to all the wedding guests by OCParks.com to visit the Madam Helena Modjeska Home Tour. World renowned, she was considered the best actress of her time and had her own celebrity endorsements in flatware, perfume and candies. 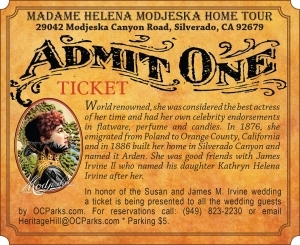 In 1876, she emigrated from Poland to Orange County, California and in 1886 built her home in Silverado Canyon and named it Arden. She was good friends with James Irvine ll who named his daughter Kathryn Helena Irvine after her. To learn more about her amazing life click here. These beautiful vintage pews are from a 100 year old Catholic Church located in Riverside, California. Susan and James wanted a outdoor wedding in the beauty of the rose garden James played in as a boy. They also loved the look and feel of a traditional church wedding in honor of Susan's Catholic upbring. Walking down the aisle surrounded by nature and vintage pews will hopefully remind guests of what an incredible celebration this wedding ceremony really is. My Luxe Wedding is a custom design studio that provides wedding invitations and florals. Their mission is to help clients treat their guests to the ultimate visual experience with invitations that boast elegant jewels, fabulous fabrics, exclusive papers and the most intricate design details. Owners Andre and Nida Taylor worked closely with Ms. Jeske to incorporate elements of the invitation that were important to her. 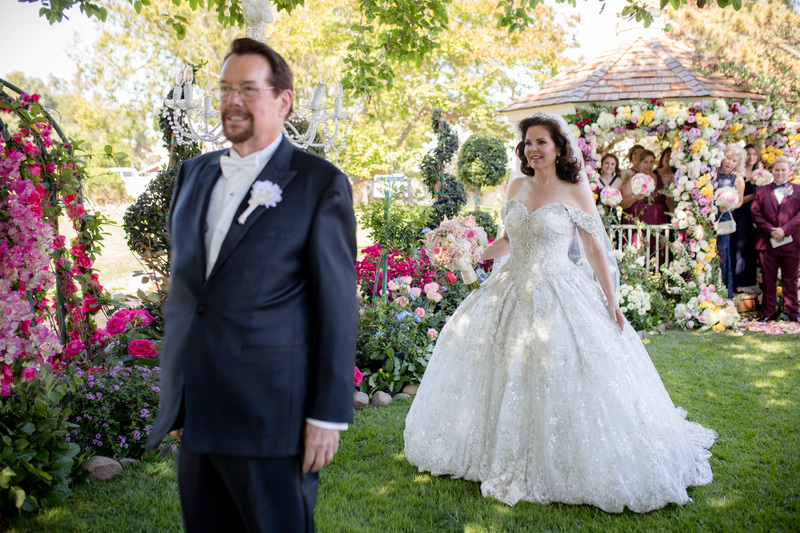 They began the process by selecting a concept that was undeniably elegant yet timeless, tasteful and inviting to each guest of honor, which includes everyone that Susan and Jim invited. Each invitation was handmade with care and artistic flair. A blush pink, dupioni silk fabric was selected for the base of the invitation and the paper layering combined ivory, gold and a patterned paisley to enhance the artwork on the announcement layer. An ivory satin ribbon was used to feature at its center-point, a hanging teardrop jewel that adorns the top of the invitation like a beautiful chandelier. Just a hint of burgundy was incorporated to add a pop of Jim's favorite color. 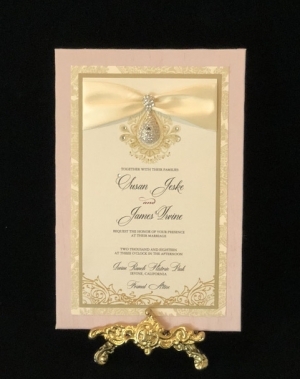 My Luxe Wedding was honored to provide its services toward Susan and Jim's wedding and they hope each guest will be delighted when they open their invitation. Now into his 18th year, Kenneth Kurts built a traveling forge for demonstrations at events highlighting the 18th and 19th centuries. A blacksmith has always been important to the Irvine Family. Going back to the days of horses and animal powered plows, thru early automobiles that frequently broke metal parts and all the way into the 1970’s when the East Irvine Blacksmith use to repair dragsters and funny cars for Orange County International Raceway. A blacksmith was always necessary whenever you had large amounts of tractors and implements. All the trades involved on the Irvine Ranch in the 18th and 19th Century were dependent on the Blacksmith and The Irvine Ranch could not have survived without him. The Irvine Blacksmith was even involved in the conversion of a Cadillac into The Ranches first firetruck. In honor of this highly esteemed position a demonstration of the old traditional form of Blacksmithing during the 18th and 19th century will be highlighted during the cocktail hour. As a special gift, a hand forged artistic piece will be presented to the wedding guests. On June 2, 2018, AlertTheGlobe.com opened their channels and streamed Susan and Jim’s wedding to the world through their LIVE streaming service; giving family and friends who couldn’t make the prestigious event a front row seat without leaving their home. From the start of the wedding, to the reciting of the vows – there were interviews from key figures attending all the way through to the sparkler send off – AlertTheGlobe.com gave viewers the full spectrum of the fairytale wedding. AlertTheGlobe.com is a website created with a unique and proprietary system that connects musicians and music lovers around the world, using a never before seen platform that offers instantaneous delivery to the world. The All-Star group of Advisors who have been behind the AlertTheGlobe.com movement are Bernard Fowler, vocalist with The Rolling Stones; Waddy Wachtel, guitar legend and Music Director for Stevie Nicks; Roy Bittan, keyboard player for Bruce Springsteen’s band; Greg Bissonette, drummer with Ringo Starr’s band; and Rob Shanahan, personal photographer to Ringo Starr just to name a few. “Our live stream will change the way you see us and we see you”, says Fowler. Upon losing his daughter, Jessie, to inoperable brain cancer on January 5, 2012, he formed the Jessie Rees Foundation and has functioned as Chairman of the Board to ensure that children fighting cancer have the support and resources they need to “Never Ever Give Up.” He shares this inspiring message in his newest book Never Ever Give Up: The Inspiring Story of Jessie and her JoyJars. Through his leadership, the Jessie Rees Foundation has raised over $4,000,000 dollars in donations to care for children impacted by cancer. 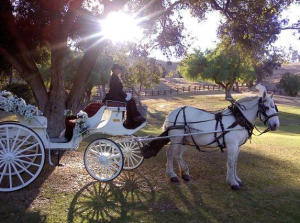 A white carriage adds romance, and beauty to a wedding that cannot be achieved any other way. They are very formal carriages called Vis-à-vis, which means face-to-face in French. The King of France designed these carriages for his Royal family. They were, and still are, considered the height of beauty, elegance and civility. A 17 year Broadcast Journalist with an emphasis on Public Relations and Community Affairs, Kelly Bennett has been a reporter, anchor, senior assignment manager for radio and broadcast stations then transitioned into public/community affairs; managing community/public relations for Adelphia Communications and Time Warner Cable. In 2009, she created Bennett Unlimited PR - a Public Relations, Promotions and Event Production firm, specializing in non-profits, community based organizations, individuals and new businesses. Some of her clients have been seen on Inside Edition, HuffPost Live, CNN, The Morning Scramble, Getty Images, Huffington Post, PRPhotos.com, New York Magazine, KTLA, Good Day LA, MSNBC, The Morning Blend, OC Register, Orange Coast Magazine, Rivera Magazine and other news media Nationally and Internationally. She co-hosts a morning radio program “Breakfast with Gary and Kelly” which can be heard on KSBR 88.5FM as well as the LIVE TV version on Cox and Charter television, the internet and on YouTube. 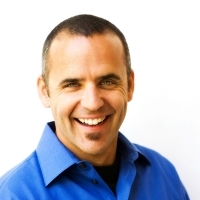 Bennett also is the Society Editor for five weekly newspapers; Newport Beach News, Coto de Caza News, Mission Viejo News, Ladera Ranch News and San Clemente News. Her column covers non-profit galas, events and lifestyles of the society scene. Thyme Well Spent is a husband and wife team that prides themselves in using the best organic, local, sustainable products to responsibly create unforgettable culinary creations. Food is their passion and they strive to put that passion and pride onto each plate. To them food is more than just something we eat, its art, it’s a way of life, its what keeps our bodies running. Food is what drives us, and the quality, passion, and drive shows through each and every savory bite. Creating experiences one table at a time! because they were once grown or raised on the Irvine Ranch. Each menu was handmade with care and artistic flair by My Luxe Wedding. 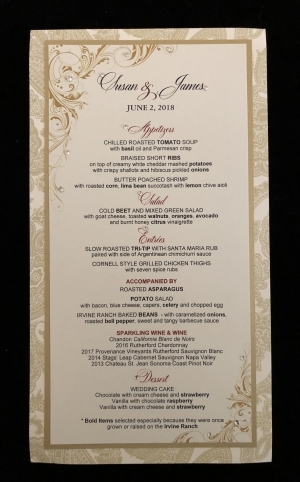 A gold and patterned paisley silk was selected for the base of the invitation and the paper layering combined ivory, gold and a floral pattern to enhance the artwork on the menu layer. 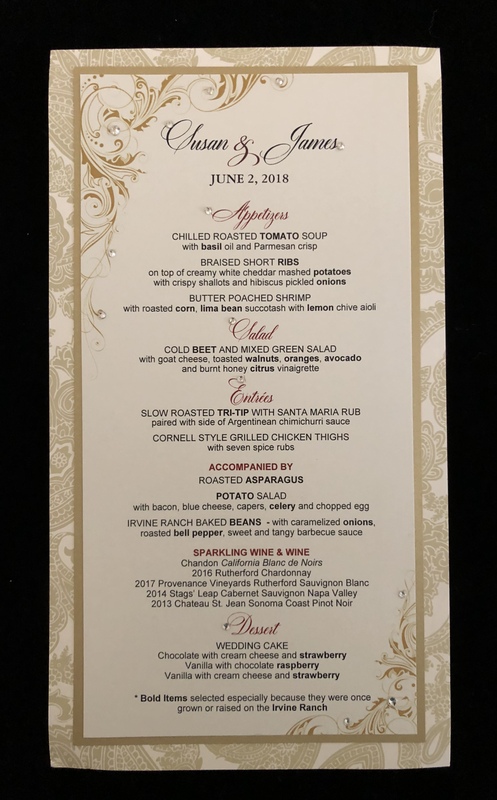 Just a hint of burgundy was incorporated to add a pop of Jim's favorite color along with 14 Swarovski crystals sprinkled throughout the Irvine Wedding Menu. When searching for my perfect bridal gown, I knew that a historic, elegant wedding needed a gorgeous one-of-a-kind gown to match. After trying on gowns at several local bridal boutiques, I had my perfect bridal moment at Mon Amie Bridal Salon. The premiere bridal salon carries exclusive couture designer gowns and has been serving brides for over 40 years. I attended Mon Amie’s Stephen Yearick Trunk Show where brides may view the designer’s entire collection and work one-on-one with lead designer, Leigh Price. 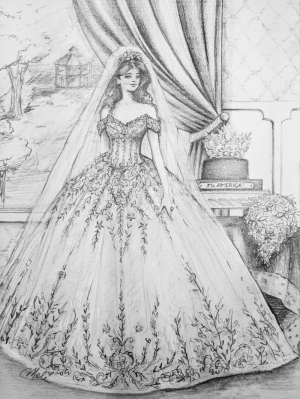 Alongside Price, we designed a custom Victorian wedding gown fit for a princess. Price and Mon Amie’s expert alterations staff were there every step of the way as I continued to add custom embellishments and tailor the gown for a perfect fit. My wedding gown is truly a work of art and working with Leigh Price and Mon Amie’s owner, Laurel Mungo, was a dream. 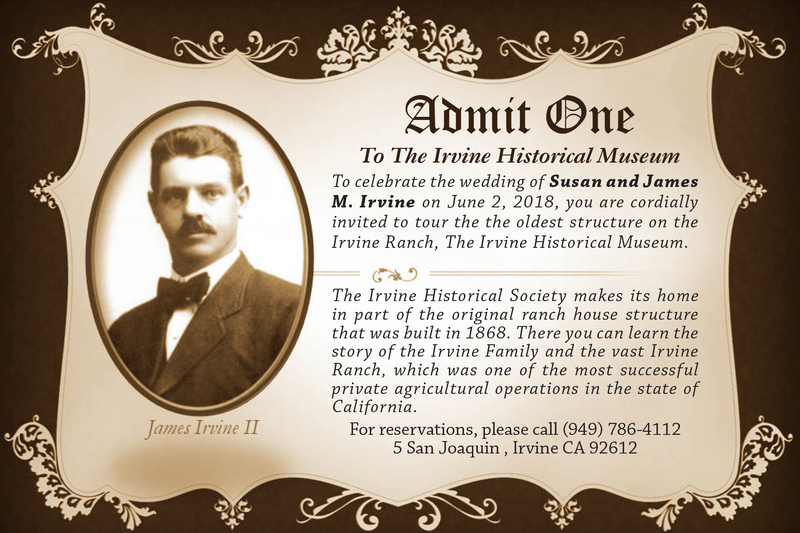 To celebrate the wedding of Susan and James M. Irvine on June 2, 2018, you are cordially invited to tour the oldest structure on the Irvine Ranch, The Irvine Historical Museum. The Irvine Historical Society makes its home in part of the original ranch house structure that was built in 1868. There you can learn the story of the Irvine Family and the vast Irvine Ranch, which was the most successful agricultural operations in the state of California. 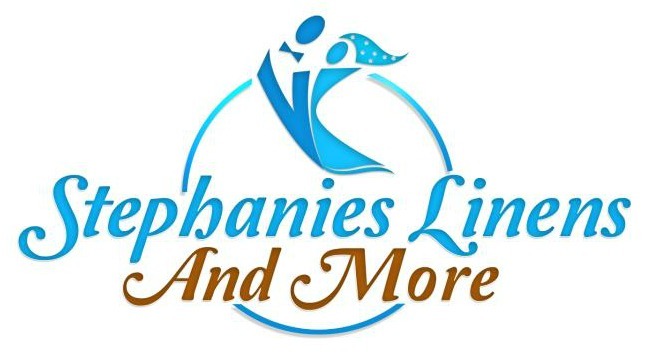 Stephanie’s Linens and More is a family owned business that was started by a small Hispanic family from Long Beach, California in 2003. Imelda Lorena, CEO of Stephanie’s Linens worked in the hospitality industry for over 10 years as a banquet server and captain. Imelda Lorena was inspired to start her event rental and decor company while working under the Marriott Corporation and Westin. Her interest in the event industry sparked after countless banquet setups for weddings, corporate events, birthdays, proms, etc. She felt these events were missing creativity. That is when she decided to invest in chair covers and sashes in a variety of colors. Stephanie’s Linens is named after Lorena and Victor’s daughter Stephanie who was only 9 when the business began and has been involved until now at the age of 21. 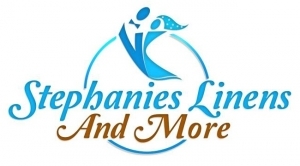 When Stephanie was only 11 years old, she created the first website for the company with grammar help from one of her teachers and has been the only person allowed to update it or make any changes to the page (www.stephanieslinens.info). With Victor and Stephanie’s support, Lorena became a preferred decor vendor at the hotels she was working for. The family of 3 (now 4) would deliver and setup 1-2 events per weekend. Lorena had to leave her Hotel jobs behind in result of her business growing and clients constantly calling. A few years later, Victor quit his job in landscaping to dedicate himself to the business full time and continue to invest in additional rentals that would add on to their inventory. What started off with a few chair covers and a small team based in Long Beach is now a full service event rental company with 2 showrooms and 30-40 events per week all over the Los Angeles and Orange counties. Today, the business is still operated by the family. Lorena and Victor can be found at the Signal Hill showroom making sure their employees are being productive and everything is running smoothly. 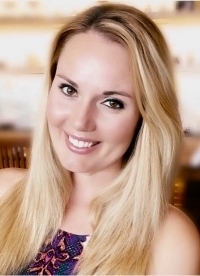 Stephanie manages the Irvine showroom and is dedicated to helping clients in Orange County and the surrounding areas. Stephanie’s Linens offers everything from high quality linen to white seamless dance floors for extremely competitive prices in the event industry. The family hopes their business will continue to grow and reach out to people all over Southern California. Angela Hall is the Owner and Principle Planner and Designer of Hall Occasions. A leading Orange County based full-service special events planning and design company. Recognized for producing some of the most imaginative and luxurious celebrations, Angela has garnered an industry-wide reputation for her widely-published work and unparalleled design portfolio. With over a decade of experience, her unique ability to add a creative and uniquely memorable edge to a brand or special event is what has made her work so recognizable. After graduating in 2010 from University of Nevada Las Vegas, with a Bachelor’s Degree in Hospitality-Meetings and Events, Angela moved back to Southern CA where she was born and raised, with her husband and baby at the time to raise her children and start her own company after years of training and experience in Las Vegas Hotels and Resorts, wedding venues and convention spaces. Hall Occasions specializes in weddings, corporate events, social events and intimate gatherings. Whether an estate wedding, beachside wedding, or luxurious ballroom wedding, Hall Occasions passion is to create one of a kind experiences for the bride, groom and their guest both domestically and internationally in any setting. Her attention to detail and love for design is represented in each wedding, or event she produces adding in the couples love story and personalities to their big day.